How can you say to your brother, ‘Brother, let me take the speck out of your eye,’ when you yourself fail to see the plank in your own eye? Christianity’s general failing in this area is obvious to most of us heathen and unchurched, as well as (I hope) to those Christians among us who still emulate the actual spirit of Jesus. Granted, it’s not easy to be cognizant of your own glaring hypocrisies. I don’t consider myself immune from this human predisposition. Having this understanding of the “Christians” around me though means nothing to those who would benefit from my insights. They aren’t listening and even if they were they would reject it out of hand. Since I’m not a Christian how can I be believed anyhow? When you have real faith, reason won’t trump it. It’s one thing to have a lot of the devil in you while proclaiming your devout holiness. It’s another thing entirely to actively work for the end of the world. The latter is intensely evil. And yet as Cenk Uygur of The Young Turks points out, 25% of voting age Americans are hoping for the end of the world and are actively trying to bring it about by voting for people like Donald Trump. America sent a couple of them to Jerusalem the other day to celebrate our unwise decision to move our embassy to there. As you may have read, it led to the death of 62 Palestinians and the wounding of 1200 others or so who were protesting along the border between the Gaza Strip and Israel. “Praise be to Jesus”, say these end-of-the-worlders about this embassy move. That’s because they can check off one more item on their dubious list of conditions for bringing about Armageddon that they have somehow discerned from reading the book of Revelations. Although the New World wasn’t even imagined in Jesus’s time, apparently one of the conditions for bringing about Armageddon was for the USA has to open an embassy there. Go figure. More than anything else, they want the end of the world. If they can pull off the Biblical conditions, Jesus finally returns to Earth. They can’t wait to be rhapsodized because they are true believers. Oh, and part of the prophecy is the rest of us get to die what looks like painful and miserable deaths, apparently a very Christian thing to do. For 62 Palestinians, they are already fulfilling the prophecy courtesy of the Israeli military. The Lord does work in mysterious ways. Among the speakers at the opening of our embassy were pastors John Hagee and Robert Jeffress. Back in the 1990s, Hagee had said that Hitler was fulfilling biblical prophecies because his Holocaust caused the creation of Israel. That sure sounds like maybe the Holocaust was okay, at least by him. Jeffress is on record as saying Mormonism and Islam are heresies “from the pit of hell”, said Catholics were led astray by Satan and said that President Obama was “paving the way” for the Antichrist. You would think this might disqualify them from speaking at such an event, but apparently they were featured speakers. Trump’s evangelical supporters form the base of his support so of course they were featured. Apparently it’s not enough to allow the natural course of events to bring about Armageddon; they must coach it along. So it’s all smiles from these people as more misery and destruction happen across the Middle East. That’s because they see these events as signs that Jesus is getting ready for his second coming. They are not bothered at all by their advocacy of these events. They think they are doing God’s work. That’s right: they have to help others kill lots of people so the Son of God can return to earth and make sure they are raptured. This is sick, sick, sick. Evangelicals are becoming the Antichrist they are looking for. They are clearly suffering from a case of toxic religiosity. The rest of us don’t matter. The rest of us know what these faith-based people don’t: there is no God (at least nothing resembling what they believe in), that we only have this one planet and that most of us just want to live in it peacefully and for everyone to get along. Jesus was all about love and peace. How on earth can they be pushing for hate and war instead? What the hell is wrong with these people? If I could be dictator, I would do away with all religion. It’s pretty clear that it works against its own professed aims. It does nothing to unite us, but plenty to factionalize us. It provides a false certainty in an uncertain world and gives its believers a faith and rationalization to inflict endless misery on the rest of us. These kinds of religion are toxic and ultimately self-defeating memes that by its nature must wash over the rest of us who simply want to live decent and peaceful lives. Doing away with religion wouldn’t mean that mankind would still not be rift in conflict. The communists recognized that religion was evil but even official state atheism could not kill it. If it’s not religion, then ethnic, racial and rich vs. poor conflicts would likely prove just as good at inspiring us to hate. Some of us though believe that we have evolved past this crap. What we need are rational leaders, people that think through the likely consequences of their actions instead of relying on their biases and impulses. We want leaders that look to diplomacy to solve problems instead of dropping bombs. Perhaps old-fashioned scorn would work. We should call out people like these Evangelical Christians and hold them to account for stoking the flames of hatred, certainly not to convince them but to convince others on the fence. We are not seeing much evidence of this now, as these people wrap themselves in the cloak of a false Christianity. However, the rational among us must proclaim them for what they are: perhaps nice-sounding people with an evil core perturbed by a religion that says they must be right. They must be opposed at every turn. It’s been clear to me for a while that Republicans are authoritarians. Of course, all political parties want their ideas implemented into law. In this country it’s supposed to be done through persuasion and an open and democratic process. But when I look at today’s Republican Party, I’m having a hard time convincing myself Republicans are not generally fascists. Yes, yes, I know. They are the freedom party. Two days ago House Republicans passed version 2 of the oxymoronically named American Health Care Act, a version that was significantly crueler than the previous version that lost by a small margin. This one didn’t do much better, but did pass with four votes to spare. They want to give Americans the freedom to go without healthcare coverage again. They have that freedom now, but it requires paying a penalty to Uncle Sam. Freedom they tell us is not free, but in this case it had to be truly free to be freedom. This strikes me as a strange version of freedom. In general the sorts of freedoms they are pushing look dubious at best. They want school children to have the freedom to eat unhealthy lunches again. They want parents to have the freedom to keep their children from getting vaccinated. They want the citizens of Flint, Michigan to have the freedom to drink dirty water full of lead whether they want to or not. They also want parents to have the freedom to send their children to charter schools using our tax dollars without charter schools being held to the same standards as public schools. And they want all of us to have the freedom to breathe air contaminated by unchecked industrial pollutions again. They sure don’t want pregnant women to have freedom over their own bodies. They don’t want to grant to poor people the freedom to accept food stamps, at least not without first peeing into a cup. In general they don’t want blacks, minorities and liberal areas to have the freedom to easily vote or at all. Republican secretaries of states find ever more creative ways to scrub their voter rolls. They clearly don’t want to give Democrats political power proportionate to their share of the population and will create crazily gerrymandered districts to disproportionately overstate their political power. And it’s not just Democrats. They don’t want to extend that freedom to moderates either, the bulk of the country. Democrats at least have minority status. Moderates are pretty much unrepresented. So it’s pretty clear what their intent is: to dramatically overstate their political power so they can force the majority to do what they say. Supposedly they are following a democratic process, but not really. There is nothing democratic about gerrymandering, regardless of which political party is doing it. It’s legal because the constitution delegates most criteria for voting to the states, but it’s not democratic. Our Electoral College that for the fourth time put into the presidency someone who did not win the popular vote is not democratic either; although it was the price we paid to bring the southern states into our union more than two centuries ago. All this gives Republicans power, but not legitimacy, which is why there are so many protests going on. Deliberately and systematically Republicans are doing everything possible to make us tow their line. Using the vast capital of the wealthy class, they largely control the popular media. As Marshall McLuhan long ago noted, the medium is the message. But fascism? Would it be too much to say that Republicans want to do away with democracy and institute a fascist state instead? Thanks to Republicans, their persistence and their money we effectively have an oligarchy. Former president Jimmy Carter said just as much. So I went to Wikipedia and studied fascism to find out. Modern fascism was defined in the last century, principally in Germany and Italy on and before the Second World War. Wikipedia defines it as a form of radical authoritarian nationalism. So overstated nationalism is (or was) certainly a key to the being a fascist. With Donald Trump’s elevation to the presidency we arguably have an ardent nationalist as chief. Only he is fighting for a largely mythical version of America some sixty years earlier. Fascists also think liberal democracies are obsolete. I’ve outlined plenty of evidence of this already. Totalitarianism is a key feature of fascism. To get there you have to take away power from those who don’t agree with you. They have been very successful there through gerrymandering, voter suppression and many other tactics, some quite illegal. Lately we’ve been seeing the troubling rise of brownshirts: formal and informal right-wing paramilitary organizations that will take action when they feel it is necessary. We saw brownshirts and anti-fascists (brownshirts on the left, but many fewer) come to fisticuffs recently at Berkeley on April 15. I believe the possession of so many guns in this country is generally a “be prepared” statement from these brownshirts so they can take action when society crosses some sort of nebulous boundary they won’t tolerate. The existence of these groups is evidence, if not proof, that lots of totalitarian wannabees live among us. Judging from their numbers at Trump rallies it’s a sizeable bunch. I don’t see yet a desire by Republicans to nationalize industry, although Trump has said he want to in-source everything possible. It may be that nationalization simply doesn’t work in the 21st century with so much international trade. Fascists though sure like strong leaders, and Christians in particular like to play follow the leader. They already follow a largely false version of Jesus. They sure don’t like any ambiguity. It gives them the hives. Trump played them masterfully in the campaign and they voted for him in droves. While his poll numbers decline, he hasn’t lost the authoritarian base of his support, and probably won’t as long as he keeps up his bragado. Trump himself is clearly authoritarian. He praises dictators and discount moderates. He has no patience for the messiness of republican government. It’s wholly reflexive because this is the way he has run his businesses. So is true of much of the moneyed class. They are used to being in charge and having respect they assert is due their wealth and station. So while we are clearly not there yet, we clearly have in charge a party and a president with fascist tendencies. And it’s not like we haven’t traveled part way down this road. An oligarchy is a big step toward getting there. It’s unclear whether our three branches of government can check the rise of the fascists, particularly when one party controls all three branches. As for me, I intend to keep doing all I can to not let fascism happen here. I think it’s a lot closer than we think. For being “retired”, life sure is keeping me busy, too busy to find much time to blog. The thing about being retired is that you can do anything you want. For me this means doing more of the stuff I love, which is teaching and consulting, both of which provide some income too. Blogging doesn’t bring in any money so it tends to sit on the back burner some weeks. For the last two weeks or so I’ve had little downtime. Yeah, right. I’m careful not to leave snarky comments with Rick, my brother in law. I have to live with him and he’s a good husband to my sister too. We can easily push each other’s buttons but choose not too and arguably I’m more publicly expressive of my opinions than he is of his. Yet the photo really irked me. First of all, I sincerely doubt Trump has uttered a sincere prayer in his life, unless it was to plead to God to bring him more money. Second, for all of Obama’s haphazard churchgoing, Obama is something of a regular churchgoer compared to Trump. As best I can tell the only time Trump goes to church is to attend weddings, funerals and more recently political events. At a prayer breakfast in February he used the religious occasion to pray for poor ratings for The Apprentice, now that Arnold Schwarzenegger in playing the boss. As for the rest of these White House “Christians”, Jesus would not recognize any of them as his followers. I won’t expound here about hypocritical Christians in general because I’ve done so many time, including this post. I … just … don’t … get … it. I don’t get how these “Christians” can believe they are Christian. I don’t believe Trump thinks he’s a Christian and I doubt he spends a millisecond thinking about God or concerning himself with the poor, except to pick their pockets. Speaking of brothers in law, I have another one, well, not quite a brother in law, but the husband of a niece. We recently got into something of a civilized rant on Facebook. My niece was wondering if there were any really great men in the world. She lives in Knoxville, Tennessee. I said: drive a couple of hundred miles south to Plains, Georgia some Sunday and watch the 39th president, James Earl Carter, teach Sunday school. Or watch him, age 90-something, nailing boards into walls at one of the many Habitat for Humanity houses he and his organization help construct. Jimmy Carter gives me hope that there really are some true Christians in the world. After all, he won the Nobel Peace Prize and the Carter Center has overseen more than a hundred elections, spreading democracy across the world. But none of that mattered to my niece’s husband John. He has spent too much time watching Fox News. And somewhere in there he heard that Carter sent money to commies, Manuel Noriega of Nicaragua in this case, although we’re talking about the late 1970s. What a horrible man! Granted that history was not kind to his short presidency, but he did get a Nobel Prize from it and took unpopular but correct actions, such as agreeing to turn the Panama Canal over to the Panamanians. We kept the discourse pretty civil, largely due to his wife Sandy who was probably sending him IMs saying she wanted to stay on my good side. Alas, neither John nor brother in law Rick have anything good to say about Jimmy Carter, the most prominent example of a true Christian I can think of in today’s world. Jimmy Carter is by no means a saint, but he is a saintly man. He is holy in my mind, one of a handful of holy men in this world for who this honor should be obvious. 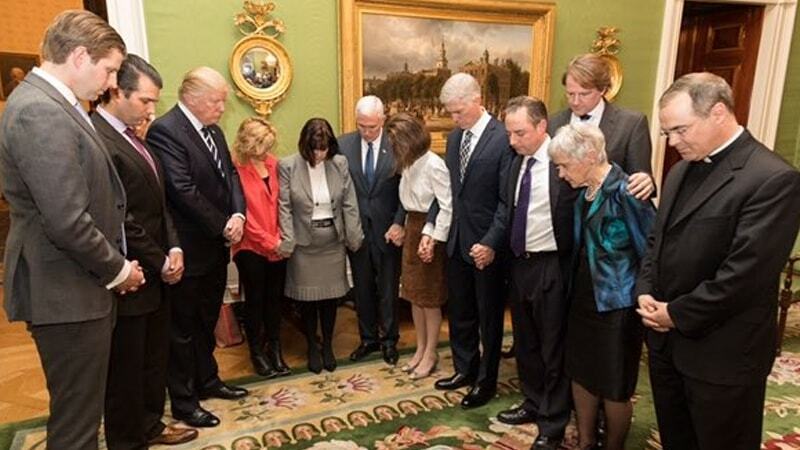 But not to John, not to Rick, and probably not to any of them people in the photo, except possibly the minister leading these hypocrites in prayer. Doubtless immediately after the photo op, the base applauded their “true Christians” while the subjects went back to deconstructing the administrative state, the professed aim of Trump’s senior adviser Steve Bannon which hopefully will include a new world war too. I wish I could be a Christian just long enough to believe in Hell. With a few exceptions, I’m having a hard time thinking of a group of people more deserving to spend eternity there than the hypocrites in the photo. Fortunately, Jesus loves even dregs of humanity like them, even though their sacred mission seems to be to facilitate Satan by making more Americans poor, sick, hungry, anxious and scared. Well, I’m not a Christian. Although I don’t believe in hell, here’s a toast wishing them a speedy entrance to it anyhow. The whole bunch of you in that photo can go to hell. Always eager to draw attention to himself, our president elect has embraced the meme that there is a War on Christmas. Specifically, he hates “Seasons Greetings” and “Happy Holidays”. To fight back he is going with “Merry Christmas” and let the non-Christians and their stupid feelings be damned. Non-Christians like, well, Donald Trump? This is a man who pretty much never goes to church. It’s clear he actually worships at the Church of Mammon. He’s got plenty of company there, including most Republicans. But maybe he has a point. What do we really mean when we say “Merry Christmas”? It suggests to me that we want people to be happy because it’s the Christmas season. That works pretty well. Most of us are merry when we are getting free stuff. That’s what Christmas is really about these days: a chance to maybe feel happy with a sudden influx of stuff, usually on Christmas Day. Sometimes it’s actually stuff we want! And if there is anything Donald Trump likes, it’s the accumulation of more stuff: money, property or the real thing he values most: attention and adulation. Trump though can’t wait until Christmas for attention. He demands it all year round. If he feels he’s not getting enough of it he’ll post something outrageous on Twitter to make sure people are talking about him. What a blessing then to be POTUS come January 20, because people are always interested in what the president says. They have no choice. The attention cycle will be nonstop! Of course a lot of it will be negative attention, something Trump will discover soon after getting into office. Like it or not the president is perceived responsible for everything. A good carnival barker like Donald Trump though will keep the public distracted by sideshows, which is a pretty good strategy as long as it works. At some point though too much real life will interfere and at that point being POTUS will cease to be fun. Meanwhile, he’ll use memes like the War on Christmas to lead us around like circus animals under the big tent. It succeeds in not only drawing attention to himself, but also in getting his supporters enthused. This is important because he will soon be picking their pockets. With enough War on Christmas-like gimmicks they may not notice when their Obamacare or food stamp benefits go away. It’s clearly an effective strategy for now as it pushes just the right buttons that Republicans like to have pressed. Because you see they are so oppressed being Christians in their own country! And they’ve had being politically correct up to here. In truth most Christians are not Christians. They are certainly not the sort of Christians that Jesus envisioned, you know the kind that live without possessions and give the shirt off their backs to strangers. The accepted alternative for first world Christians is to do token acts of charity around the holiday season. Mostly this involves writing checks to their churches or politically compatible charities. But sometimes it involves some actual in-person demonstrations of what Jesus might have done, such as serving meals in a soup kitchen to the homeless. It’s a faint echo of what Jesus had in mind for his church, but at least it’s an echo. Don’t expect to see Donald Trump in a soup kitchen. It’s not clear he knows how to use a ladle or clean a pot. No one ever taught him how these things are done. Saying “Happy holidays!” is certainly not anti-Christian, as there are plenty of holidays this time of year. Only two are Christian: Christmas itself and the Epiphany, which literally is Christmas if you are Eastern Orthodox. There is also Thanksgiving and New Years, which are secular holidays and in Great Britain there is also Boxing Day. And, oh yes, there are those other you know second-class religious holidays that also happen this time of year, helpfully captured on Huffington Post. Hanukkah happens to fall Christmas week this year, which may be a reason for Trump to draw attention to it. (It doesn’t hurt to have a Jewish son-in-law.) But we also have Bodhi Day on December 8 (Buddhists), Mawlid an Nabi on December 18 (Muslims) and Winter Solstice on December 22 (Pagans). So no wonder they are enthusiastic about promoting a War on Christmas. What they don’t see is that when elected officials keep the holiday generic is not a bad thing; it’s there by design. It’s a statement that government operates in a religiously neutral environment. And that’s what really gets their goat. They don’t want it to be that way. They want a government for White Christians only. And by refusing to be politically correct, this is what Trump is tacitly telling them he’s going to deliver. Unsurprisingly, they love him for his clannish behavior. As for Jesus’ call to love all, including the non-Christians (see the Good Samaritan parable), well, clearly not so much.